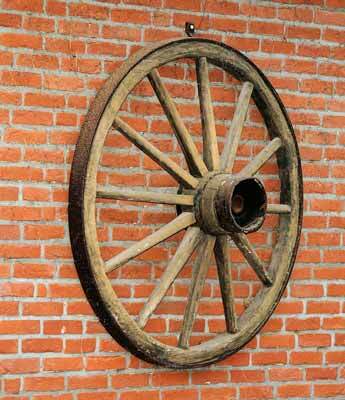 A wagon wheel is a timeless piece of wall decor that can be used by itself, grouped with other wagon wheels, or used along with other pieces of decor. 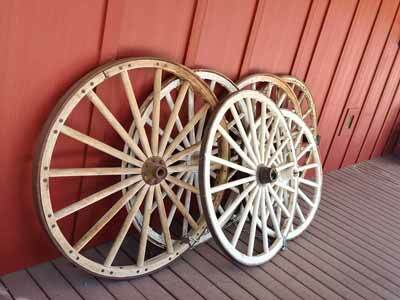 Wagon wheels create a decorative Western or rustic look in any home or business. Below is wagon wheel wall decor for sale on Amazon and eBay. Below: Four wagon wheels hung on a wall as home decor. A beautiful, rustic looking wagon wheel for wall decor. Below: A wooden wagon wheel hanging on a brick wall. Below are a few good things to know before buying wagon wall decor on the Web or anywhere else. Is it a wagon wheel or is it a photo or other type of wall art that includes a wagon wheel? By just glancing quickly at the photos it can occasionally be difficult to tell the difference. Look carefully at the photo(s) and read the description thoroughly to know what it is the seller is offering. If it's a wagon wheel, is it a real? Real wagon wheels are typically quite heavy and could present a challenge to hang in some circumstances. 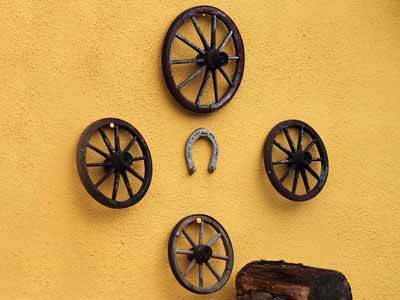 For that reason many pieces of wagon wheel wall decor are replicas that have been made to be more practical and manageable to hang than the real thing. Speaking of whether or not it's a real wagon wheel: If it's real, and even with some replicas, does it have a hub that protrudes from both sides of the wheel? If so, the hub protruding from the back may make it difficult to hang flat against a wall. If you want a real wheel you might not mind if it doesn't hang flat, but if you plan on hanging it where it needs to be flat against the wall the hub could present a problem. Find out how it will hang, flat against a wall or not flat, and make sure that fits with your plans for where and how you want to hang it. Is it new or used/old/vintage/antique? You can commonly find wagon wheels of all ages and conditions for sale on the Web, so be sure to read the description thoroughly to know if any decor you're interested in is new or from a previous era. What is the wagon wheel wall decor made of? Wood and metal are both common, but you can occasionally find pieces that are ceramic or some other material. Does it come ready to hang? Since many wagon wheels used for decor can not only be hung but also simply sat on the floor, don't assume it will come with pre-installed hanging hardware on the back. How thick is it, or, put another way, how far does it protrude out from the wall? Wherever it is you plan on hanging it, will there be room for people to sit under it, walk past it, etc., without bumping into it? How big is it? Don't just look at the photos to get a sense of size because it can be difficult to get a true perspective that way. To make sure the wheel will fit and look good where you plan on hanging it you will probably want to know the diameter, which is the measurement across the center of the wheel from one edge to the other. Will your wheel be shipped assembled or unassembled? If it's unassembled, does the seller mention what it will require to put it together? If you will need tools for assembly do you have those tools? Will it require hardware? If so, is it included in your purchase or will you have to buy it separately? How much does the wagon wheel wall decor weigh? Will the wall you plan to hang it on support the wheel's weight? Is shipping included in the price or will it be extra? If it's extra, how much will it be? How soon after you make your purchase will your wagon wheel wall decor be shipped? What shipping method will the seller use? Below: A collection of wagon wheels leaning on a wall.